This is the audio system and tool that were used in many commercial titles such as Project S-11, Shantae, ESPN National Hockey Night, and Who Wants to Be A Millionaire. Although I’ve made the tracker public for quite a long time now, the replay routines were not public, until now. You may grab the latest build of the tracker and the replay routines (included in the package) off the wiki page. To build a ROM to play on the real hardware you will need to use the Rednex Game Boy Development System (RGBDS). Instructions are in the package with two easy to use batch files for windows, there’s now a version of RGBDS for linux but I haven’t tested it. Donations to help pay for hosting, hardware, ports, bug fixes, and other costs are very welcome. 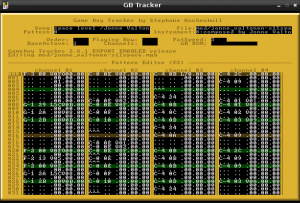 Is there any hope that the source code for this tracker will be released?